It began with a trivial moment of carelessness, but the shockwaves that reverberate from this seemingly insignificant incident, spread far and wide. Ed and his heavily pregnant wife Mary are on an errand for Ed’s ailing father before the pair depart for warmer climes. But the winter of 1962 comes early and one innocuous event and a hastily taken decision will have devastating consequences for the family of young Rose Gorton. Mary’s already fragile mental state is put under further stress while Ed tries to make sense of events that are spiralling massively, Out of Control. 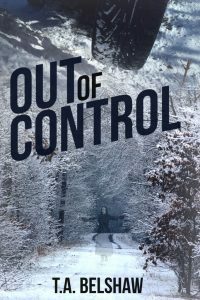 A tragic car crash on a snow-bound road triggers a series of events which expose the fault lines in a couple’s dysfunctional relationship to a horrifying degree. This is gripping, compelling stuff, which drew me in from the very first page and forced me to finish the book in a single setting. The atmosphere is beautifully developed, with the retro setting (the early 1960s), the menace of the wintry landscape and the nods to the horror genre – the creepy, isolated house, the rat-infested cellar – all lending a Gothic touch to this short, nasty tale of madness and the consequences of making the wrong moral choice. Highly recommended. Please buy it; it might encourage Mr Belshaw to write more in this genre. 5.0 out of 5 starsWhat a shock!! If you want a brilliant read with shocks galore, then buy this. Chilling in more ways than one, this novella will keep you on the edge of your seat ’til the final page. More please Mr. Belshaw. (I could see this working as a movie). Read this on Kindle in one go within a few hours of purchasing, and was quite breathless by the time I’d finished. The dialogue is snappy and the plot is tightly written, even though there are unexpected twists. I was kept guessing all the way – a first class tale !